Over fifty years ago the first team of volunteers arrived on the property where Northern Frontier now resides. Many of the buildings they raised are still being used to this day thanks to the hard work of the many hands who built them. Through the decades we have had the privilege of seeing God provide for this ministry in big ways. Due to the generous hearts of our friends, alumni, and donors, we were able to purchase the land and secure a legacy for future generations. In light of that providence, it is our responsibility to be faithful stewards of God’s gift and begin building up a legacy for the next generation. This campaign is focused on growing our relationships, improving our facilities, and developing our ministry programs to prepare us for the next fifty years. Join us as we begin to plow new ground for Northern Frontier Camp. With your contribution, we will increase our ministry in the lives of boys and men through Christ-centered camping. We ask that you prayerfully consider impacting our vision for the LEGACY campaign as we walk forward to the far horizon! I was 11 years old when I was introduced to Northern Frontier. That was over 40 years ago. Northern Frontier has had a profound spiritual impact on me and my family. Last year I attended with my father, son and grandson. I have returned almost every year since I was a boy to connect to the rich Christian environment that has so richly influenced my relationship with Jesus. It is a privilege by God that I am able to serve and invest my time in such a God-centered ministry. The most important thing you should know: boys will be men, boys and men need Jesus--that is what Northern Frontier is all about. Continue with excellence what we currently do in our summer camp. We want to build, strengthen, and encourage relationships with Christ and like-minded believers throughout the off season as well. The LEGACY campaign’s focus is to grow Northern Frontier by expanding the ministry while also preparing it for future generations. Currently, the land around OK Slip Pond is enjoyed by many boys and fathers during the summer months. Our goal is to nurture those relationships while broadening our reach to include more boys and men, families and friends. We are excited to break new ground and bring fresh experiences to Northern Frontier. As we introduce the lodge, we will take our first big step to meet our goals. This lodge will serve as a door to open new ministry opportunities during the summer and beyond. Make improvements and perform renovations to the central buildings, housing units, shooting ranges, trip locker, craft shop, waterfront, and other craft areas. Build a strong and effective administrative staff that helps grow strong CHRIST- CENTERED programs and curriculum, teaches outdoor skills, builds the next generation of Christian leaders, and promotes Northern Frontier Camp. We will improve our staff training, cabin ministry curriculum, and campfire messages. We are also looking to hire another full-time staff person. They will develop new leadership programs, assist in promotion and recruitment, and develop craft area curriculum for the future. 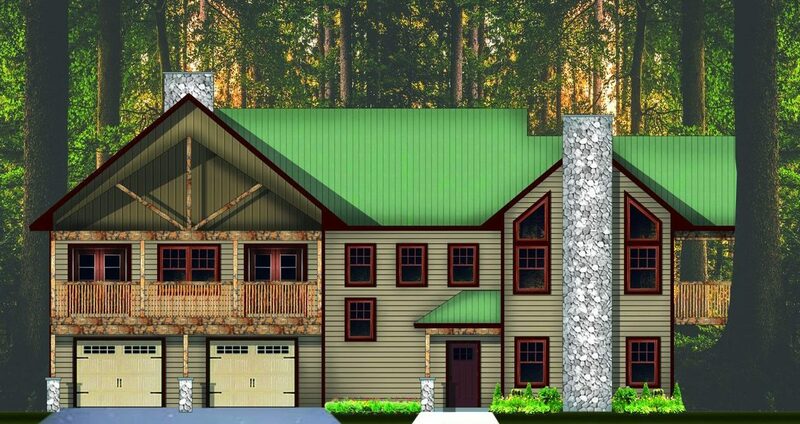 The Lodge will be a fully furnished retreat center built into the side of the hill near the entrance to the camp road. Inside will be a total of twenty beds split between two large sleeping rooms, an open kitchen with dining space, a comfortable meeting area, a living room featuring a grand fireplace, additional space, and storage in the basement, a two car garage, and a covered deck. During the off-season, this lodge will be available for Christian Service Brigade units and other like-minded Christian ministries, youth groups, small men’s groups, ministry leader retreats, missionaries on furlough, and alumni as a weekend retreat in the Adirondacks. In the past, the existing lodge (know as the Niabi lodge) has been used by families and staff to supplement what we lack with in-camp housing. However, the building is not up to code for regular use for minors and the cost of renovating it is excessive. While we will continue to use existing lodge as a welcome center for camp on Saturdays, it is our vision to build upon our existing ministry offerings by creating new opportunities and opening up Northern Frontier beyond the summer months. As mentioned above, the lodge will be open for outside like-minded groups and will allow Northern Frontier to plan for off-season programming and allow us housing during the summer for our current and future leadership programs. These improvements will strengthen our ministry as God continues to bless the legacy of Northern Frontier Camp. Since 1946 we have been partnering with local churches, Christian Service Brigade, and four generations of families to make an impact in the lives of boys and men. Our vision is to see men, husbands, fathers become godly leaders of the future. We desire marriages, families, businesses, and communities to be led and discipled by leaders who know and love Jesus Christ. We have had the joy of being part of God’s plan for seventy-three years and with your contributions, we will be ready to equip the next generation! The LEGACY campaign is a unique three-year fundraising period that aims to prepare Northern Frontier for another 50 years of ministry at OK Slip. If you are not already one of our faithful supporters then consider contributing to our general fund. It is critical that we maintain a healthy operating budget throughout the duration of this campaign. By donating to the LEGACY campaign you would be giving above and beyond the camp's typical needs. There are many ways to join NF's family of supporters. Please contact us directly if you would like to discuss additional support opportunities. The following table is a three-year projection of the types of gifts we would like to receive. First, join us as we thank God for his enduring faithfulness to Northern Frontier. Second, ask God to supply wisdom for the NF Board. We are working on plans, logistics, and timing. We desire to share progress and information in a clear and uniform way. Finally, consider if God is putting it on your heart to give now, even above and beyond any current giving, as this campaign is not part of our annual budget. Look for more details on ways you can give on our website or contact us directly to find out more about getting involved in what God is doing at Northern Frontier. Build a legacy for the next generation. With your contribution, NF can continue to impact the lives of boys and men through CHRIST-CENTERED camping. Thank you to all of our faithful supporters. Your generosity is what makes accomplishing our mission possible.